Ask Mr. Sage: What Kinds of Salvias Are Edible? I add sage to poultry stuffing and rub roasting turkey with the herb for holiday dinners. Now that I've begun gardening with Salvias, I am aware that Garden Sage is a form of the herb called Salvia officinalis. That got me to thinking: Are all sages edible? Although we are unaware of any Salvia species (true sages) that contain poisonous parts, we are cautious about which ones to recommend for culinary use. In its 2012 list of Safe and Poisonous Garden Plants, the University of California, Davis, notes the genus as being generally recognized as safe (GRAS). In addition, the Continental Kennel Club regards the genus as being GRAS. However, there are about 900 species of Salvia worldwide, some of which are rare in horticulture and many of which contain powerful chemicals that are being researched for use in medicine. Also, UC adds a warning note to its list of safe plants indicating that you should be on the lookout for symptoms, such as illness and skin rashes, after anyone or any creature consumes or is in contact with plants on the list. Responses can vary. For example, whereas one source recommends the red petals of Scarlet Sage (Salvia coccinea) as being edible, another raises a warning flag, noting that the author became ill after consuming a tincture made from the flower petals. Another general caveat is that anyone who suffers from allergies to a variety of plants -- especially people who experience allergy-induced asthma -- should be careful about eating herbs and other plant foods that are new to their diet. Please keep in mind that we are not a source of medical advice. 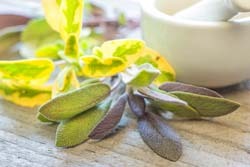 If you are going to add the flowers, foliage or roots of any sage to your diet that you don't regularly use when cooking, it's wise to check with a physician. We are, however, aware of many Salvias that are used in cooking. Here is a Culinary Sage List of all the cooking species we currently carry. Varieties of Garden Sage (S. officinalis) and Greek Sage (S. fruticosa) are the types usually referred to as Kitchen Sage. But keep in mind that sages grow throughout the world, and what is considered culinary in one culture may only be ornamental in another. These stories are, by no means, comprehensive concerning culinary sages, but they should help you in adding to your kitchen garden. so glad i found FBTS in an article in the NYT. the quality of the flowers is superb and the service is great. now where to plant all the cupheas and salvia?